My regular readers know that I don’t eat sweet stuff but my sweetie does so I make it on fairly regular basis. 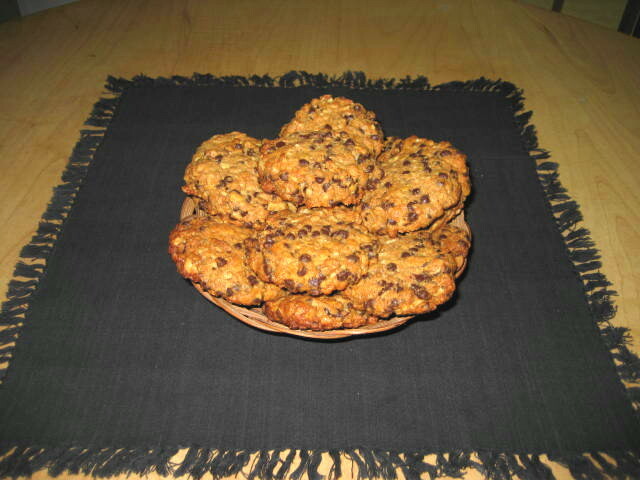 This time there were no cookies left and since we never buy this sort of thing it was time to make some. 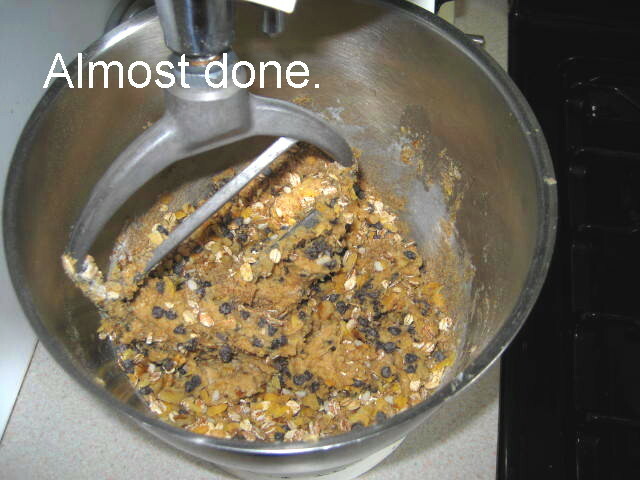 Well, I had most of the ingredients on hand except one that makes up most of the volume, Weetabix. No problem, I found a bag of Muesli with a statement in huge font saying “Good for you”. I was sold. 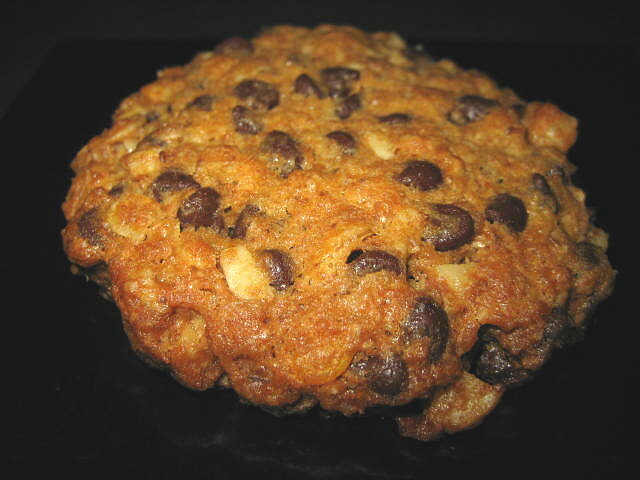 New recipe was born and after my better half tasted it and pronounced it a winner I modified my original recipe. In measuring cup you can see the Weetabix on bottom topped with muesli. 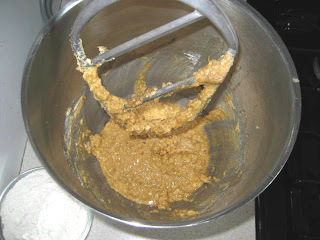 Cream together the butter and brown sugar in electric mixer and beat until light and fluffy. Add the eggs to the butter mixture one at a time, beating well after each addition. Add the vanilla and mix. 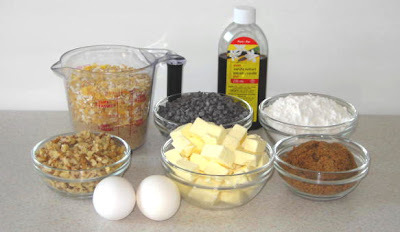 Add the flour mixture to the butter mixture and stir just until the dry ingredients are moist and blended. Do not over mix. 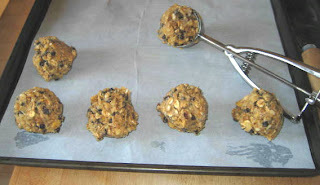 Mix in crushed Weetabix, chocolate chips and nuts until all ingredients are thoroughly mixed. Scoop the dough with ¼ cup ice cream scoop or by the heaping tablespoon and drop onto prepared baking sheet covered with baking paper and about 3 inches apart. 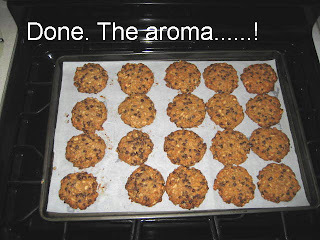 Bake about 20 minutes, until the cookies are light brown. Start checking without opening oven after about 17 minutes. Can be made ahead, rolled into a 3” log and refrigerated for up to 3 days. Then just slice with serrated bread knife. 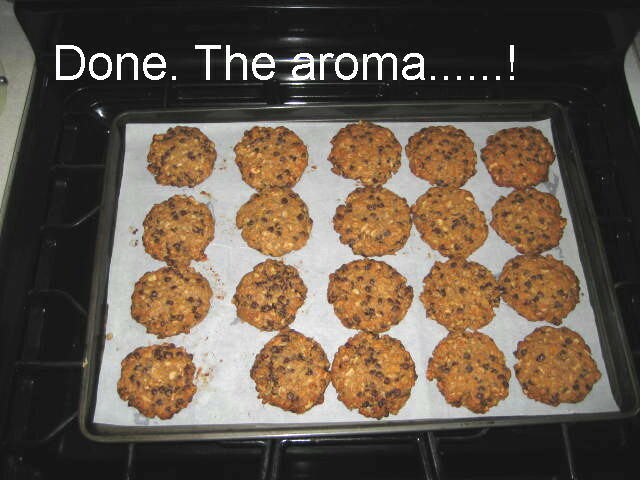 We will try the recipe for sure. I am gone taste them all.